Equipment rated as "Excellent" will show almost no signs of prior use. These items are considered to be anywhere from 90-95% of their original condition. Camera bodies will have only the most minor/small marks on the LCD that will not impact viewing ability at any brightness level. Camera bodies only show minor signs of use with no fatigue on the rubber grips. There may be very minor markings on the bottom of the camera from being mounted on a tripod. Lenses rated as "Excellent" have practically no wear on the housing and the glass elements are in pristine condition with no dust, scratches, or markings. The lens (mount) itself will show almost no signs of being attached to a camera. View information on Used Condition status definitions - https://www.uniquephoto.com/returns#usedinfo Indicates level of item use. Excellent - Shows almost no signs of prior use. 90-95% of the item's original condition. Good - Small amount of cosmetic wear and some blemishes from regular use. 80-90% of the item's original condition. Fair - Shows cosmetic wear and marks from being used. 70-80% of the item's original condition. The size of the filter that fits the lens. 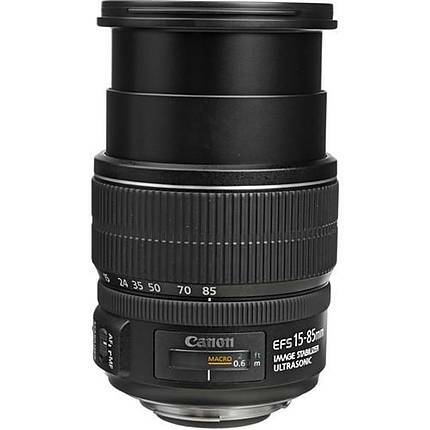 This is the type of lens. View info on our used equipment grading scale. 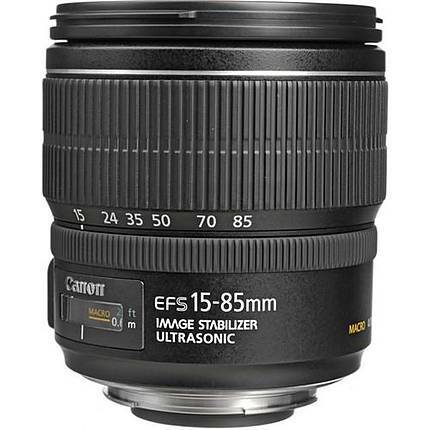 The new Canon EF-S 15-85mm f/3.5-5.6 IS USM sets a new standard for everyday photography on APS-C sensors. 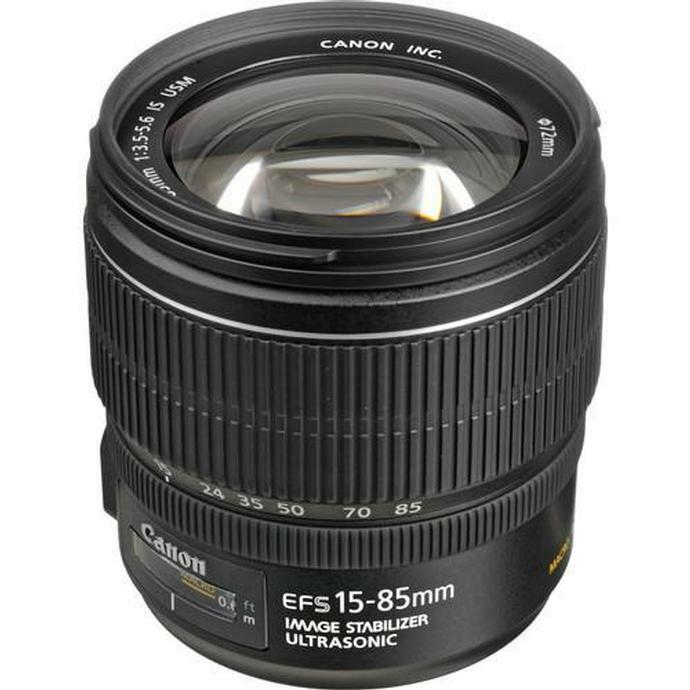 With a focal length range equivalent to 24-136mm in 35mm format, image stabilization and high-precision optics, the EF-S 15-85mm f/3.5-5.6 IS USM offers stellar performance from wide-angle through to telephoto. This is a family of techniques used to reduce blurring associated with the motion of a camera during exposure. Image stabilization helps in low light situations using slower shutter speeds. The shortest distance that a lens can focus. How wide a lens can be opened. This is the magnifying factor of a lens. Macro lenses will often be described by their “magnification factor”. 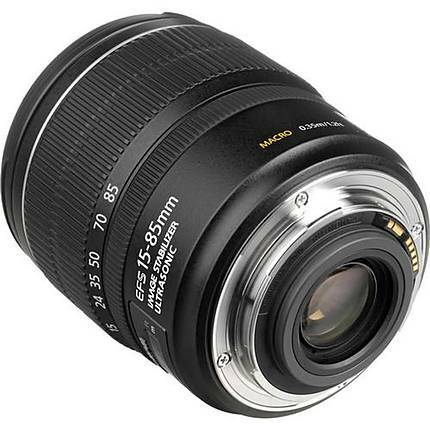 A lens with a 1:1 magnification factor produces a projected image on the sensor which is the same as the subject. The individual pieces of glass that form the overall optical construction. Most lenses have between four and eleven elements to bend the light rays to ensure a perfectly formed image appears on the light sensitive surface, such as a film or CCD. The elements are arranged in groups and may be seen in specification sheets as, for example, 6 elements in 4 groups. That configuration may have two single elements and the other four grouped in pairs. This is the type of lens hood. The type of focus of the lens from full manual control to auto focus. This is the mount type for the lens to attach to the camera body.